Sharing a booth with Guumon, Naomi Knaff is bringing an array of awesome original resin releases with her. Starting off with this DCon exclusive Cupyrr. 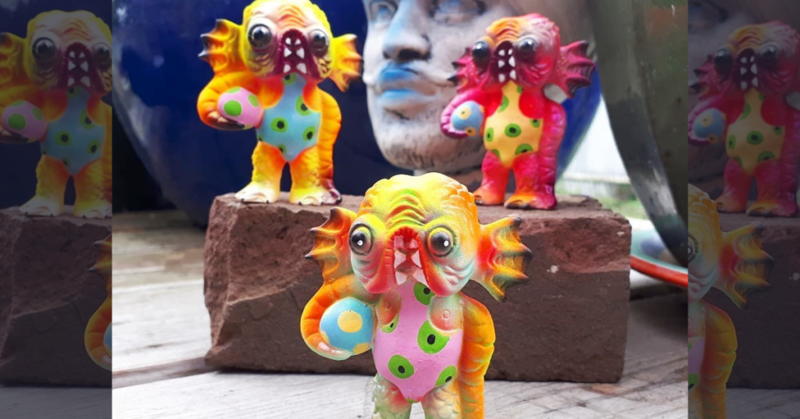 This fang-tastic resin release by Naomi is super limited to 5 hand-painted pieces at DCon, each standing at around 3inches tall. Naomi will also have painted La Morrttt and some blanks too. An assortment of awesome can be found at DCon Booth #544! Go check it out. There is even talks of a Naomi Knaff x Guumon collaboration too! Damn fire! Go give some love to Naomi on Instagram HERE. Less than a week now to go until the 2018 DesignerCon in Anaheim. To say we are pumped for this trip would be a massive understatement! We can’t wait to hang out with you all over in Anaheim! Come swing by booth #933 where you find TTC and Xpanded Universe will be rocking out all weekend. Most hungover, so bring beers! DCon tickets can be acquired HERE.